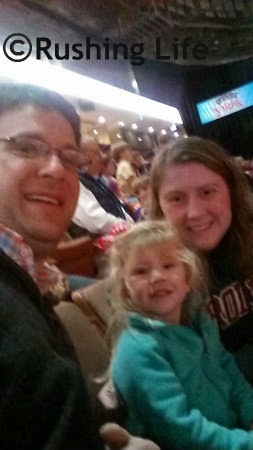 After Bimmer had so much fun (and let's face it, me too) back at the Disney Junior Live show this spring (read about our trip HERE) I was most certainly interested in taking her to see Disney on Ice when it came around. With some research, we found out the opening night tickets were only $15 a pop - so, um, DUH! We talked about it a little bit before we went, but not too much. The night before, when I was putting Bimmer to bed, I told her the next day would be super special because we would get to see princesses. And she whispered, "On ice skates?!?" So sweet! My heart just melted (and maybe my motherly pregnant hormones got rolling and I teared up too) when she got so excited when Mickey & Minnie came out. The version we saw was called "Treasure Trove" and I loved it because it referenced older Disney movies that I was familiar with - like Toy Story, Aladdin, and Lion King. Their wildebeest stampede during that part was actually pretty darn cool. Bimmer didn't really know all the characters, but she did get excited when she knew one of them... like that "sneaky snook" as she called him (aka Captain Hook) and Tinkerbell. On the drive home, I asked her about her favorite parts. She told me "the big big crocodile" and the "gnomes." Sweet girl... she had no idea who Snow White was, but gosh darn it, she liked her "gnomes." 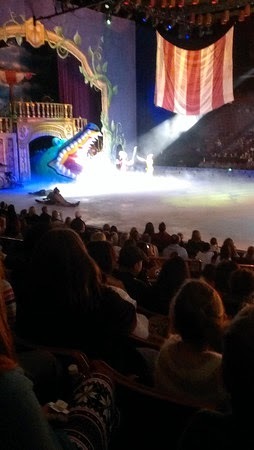 She waved frantically at them the entire time they were on the ice! Definitely don't have the heart to tell her they call them dwarves. She's just a gnome loving girl. And I couldn't be more proud. Puff and I are so blessed that we have the time and means to be able to take Bimmer to stuff like that. I know with Healey coming soon, things will change somewhat. We will have to be more selective sometimes about things like this. But I am going to expose them both to as much as I can and give them all the joy that I had as a little girl, and the joy I get from watching Bimmer is just unmatched. Next up? The circus comes to town in a few months! When we were walking out of the arena, Bimmer mentioned cotton candy. 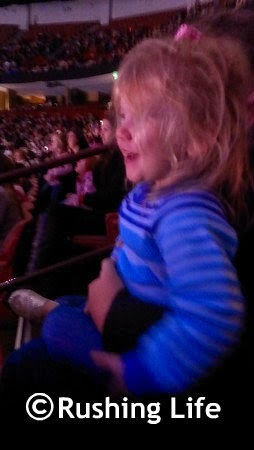 I had no idea she even knew what that was, but we promised to get her some at the circus. I'll be much more pregnant by then too... and I'm certain Healey will insist on me sharing with her. Can't wait!